• Dimmer with latest technology to control dimmable LED lamps. • Very small sixe 12mm, Universal switch box mounting dimmer for led lamps. - Dimmable 12V Led lamps with electronic transformer. • Pushbutton control: Brief > ON / OFF, Sustained press > Dimming UP / DOWN. • The minimum brighteness level can be adjusted by using the selector knob. It avoids flickers or malfunctions in the lamps. • Protected againts overloading, short circuits and overheating. • Dimmer for LED lamps in a new compact housing and connection terminals with screws. • 3 wire installation, Neutral wire required. • Leading edge (4-100W) and Trailing edge (4-350W) dimming technology, valid to control all types of dimmable Led lamps. • Allows the control of 230V (GU10, E27...) and 12V (MR16) Led lamps. • Control by conventional pushbuttons. • Modular dimmer with built-in dimming potentiometer. • IGBT technology: leading-edge or trailing-edge dimming. - Dimmable 230V LED lamps. - Incandescent and 230V Halogens lamps. - 12V Haloges lamps with electronic transformer. • Modular housing, DIN-rail mounting. • Control bu Pushbutton or built-in Potentiometer. • Up to 3 lighted pushbuttons and a unlimited number of non-lighted ones can be connected. • The front potentiometer allows dimming from the dimmer itself, without the need of an external push button. • The minimum brightness level can be adjusted by using the selector knob. it avoids flickers or malfunctions in the lamps. - Memory: by a brief press, the lamps are switched-on at the previous level before the last turn-off. - No Memory: by brief press, the lamps are switched-on at maximum level. - Auto: like Memory-mode. In addition, it has status memory after a cut-off from mains. • Master/slave configuration: it allows increasing the load capacity. • Protected against overload. short-circuit and over-heat. • Master / Slave configuration to increase the load capacity. • Control by conventional pushbuttons, potenciometer or 0/10VDC signal. • This device allows the absorption of residual or return flows, which keep certain LED lamps lit with some devices: regulators, motion detectors, etc. • In addition, it allows to increase the number of pushbuttons with pilot light connected to the same relay. • In installations where there is no regulator or detector, only switches or commutators, with or without pilot light, can also be used to absorb those possible residual currents that keep the LED lamps lit. • Safety enclosure to prevent accidental burns. • Modular Dimmer with rotary knob. • Pulse Width Modulation dimming technology (PWM). Specially-designed for single-color 12-48VDC LED Strips. • Maximum load capacity of up to 8A (LED strip 12VDC = 96W / LED strips 24VDC = 192W). • Modular housing, 35mm DIN-rail mounting. • Control by built-in Potentiometer or by external Push-button. • 1-channel dimmer for 12~24VDC LED Strips, up to a maximum of 20A. • Pulse Width Modulation (PWM) dimming technology. 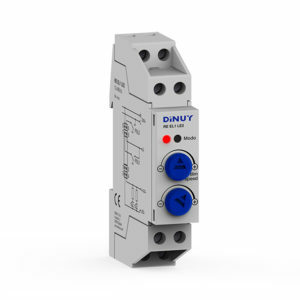 • Control modes: Pushbutton, Potentiometer or 0/10V Signal. • Master/Slave operation: with one control (pushbutton, potentiometer or 0/10V signal) is possible to control several dimmers. • Memory or No Memory functions. • Resettable protection against overloads and short-circuits. • 1-channel Wireless dimmer for 12~48VDC LED Strips, up to a maximum of 4A. • Installation into junction box. • Control mode: Remote Control (RC KNX 001). • RF signal repeater function is available. • 1-channel Amplifier for 12~24VDC LED Strips, up to a maximum of 8A. • It allows to increase the meters of LED strips controlled by only one dimmer. • 4 - channels Wireless dimmer for 12~48VDC LED Strips, up to a maximum of 10A per channel. • Four working channels: R, G, B & R+G+B. • Universal dimmer , 1 channel for RLC and LED loads. • Up to 1,000 W Incandescent maximum capacity .